During sport and other physical activities, the brain’s messages are transmitted to the muscle’s neuromuscular connection through the nerve-tract by electrical impulses. The whole-body EMS technology delivers electrical stimulation directly to the muscles causing them to contract or relax just as they do during workout. EMS technology has a long history of research and development carried out to reach perfection. There are several distinct impulses used in the fields of therapy, cosmetology and rehabilitation. These kinds of stimuli, also known as voltaic currents, are different electrical waveforms that are apt to cause certain effects. When used properly, they contribute to the recreation and growth of muscle and connective tissue, as well as to the prevention of deep vein thrombosis, thus avoiding undesirable side effects. The history of the electrical stimulation of muscles dates back to 1791, hence to Luigi Galvani’s experiment. Since then, countless research studies and sports results have confirmed its effectiveness. Moreover, technology has been registered, as a recognized muscle conditioning approach, by the U.S. Food and Drug Administration. The E-Fit devices also use the EMS technology, which has been perfected for convenient usage throughout the years. The device consists of a special suit equipped with 10 electrode pairs, a modern voltage and frequency control system regulating the treatment process. The comfortable dress is made from a breathable material, thus allowing freedom of movement and perfectly keeping the electrodes on the appropriate muscle group. Want to be healthy, sporty, fit, athletic and tight? a 20-minute personalised E-Fit training twice a week! Our goal is to demonstrate the benefits of the device and the technology to all age groups and participants in all sports, be it top-class athletes or busy businessmen wanting to keep fit. We offer help and an alternative option to the elderly in beginning the move towards a more active and exercise-rich lifestyle. The basic philosophy of the E-Fit service rests on efficiency, customisation, discretion and speed. At the heart of our mission is our endeavour to help those ready for a lifestyle change to develop a more active, healthier and health-conscious way of life. Our goal is to make the use of the training methodology offered by the E-Fit device standard practice in sports centres and gyms both in Hungary and throughout the world. We have dedicated relationships with our partners. Thanks to the Impulse-Shift Technology (IST) the E-Fit devices cause much lower heat-and impulse-load to the body; making it safer, more comfortable and more eficient to use compared to other EMS devices. IST, developed by E-Fit engineers, is a unique method that shifts the respective impulses between channels in time, so the human body is stimulated in only one spot at any given moment in an unnoticeable manner, thanks to the carefully picked shifting frequencies. Some of the greatest advantages are that the cross-impulses between the channel-pairs can be prevented and the energy need of the device and the level of the output signal can be lowered to a small fraction of the original need. This means that the overall impulse-load forwarded to the human body will equal to the power of one channel only (even when calculated for 10 channels), so the full output performance of the device with manual control is 3.5 Watt maximum and the actual performance is not more than 0.06 Watt RMS, even considering the impulse peaks and the breaks between them. In this rushing world, due to the lack of time and energy we rarely pay attention to the healthy diet and to the proper training. E-Fit provides help with 20-minute long trainings twice a week to those who are striving for a sportier, healthier and more conscious lifestyle. An EMS device in the hands of a highly qualified trainer is not only able to substitute the general fitness training but it is also more effective. Engineers at E-Fit created a mobile unit that enables the training or the posture-improving treatment to take place even in the work environment. Posture-improving exercises developed by physiotherapists in combination with the E-Fit device takes only about 15 minutes and performing them once or twice a week can result in significant improvement. 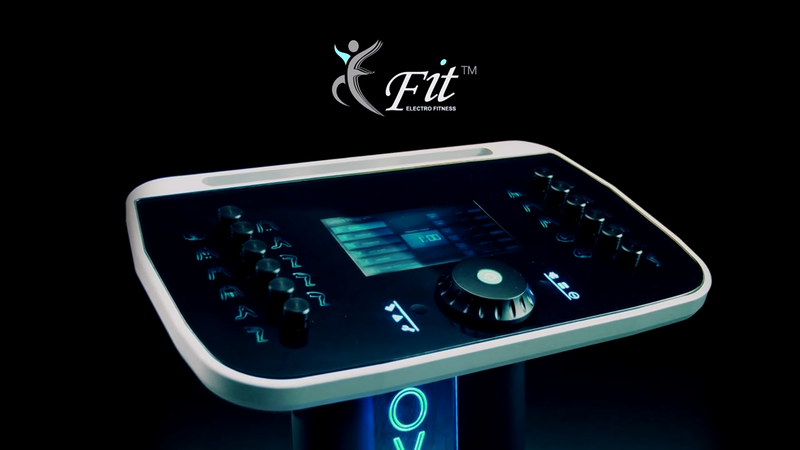 E-Fit does not only provide a new opportunity in the field of sport and active movements, but also proved to be successful in the field of rehabilitation with the preventive strengthening of the weakened core- and spine-supporting muscles, with the training of the deep muscles and in the treatment of those with established medical condition.